Say hello to Califorctenus cacachilensis, a new species of spider found in a remote mountain region of Baja California Sur. This elusive, softball-sized arachnid prefers the dark and cozy confines of caves, which seems entirely appropriate given its gruesome appearance. Also, we are never going into caves ever again. Spiders are an incredibly diverse and prolific group of invertebrates. Last month, researchers sent shivers down our collective spines when they put out a study showing that all the world’s spiders consume up to 800 million metric tons of food per year—a mass of meat roughly equal to all humans on the planet combined. Spiders are obviously very good at what they do, and they have many species to show for it. Though tens of thousands of spider species have been documented by scientists, there are still potentially thousands, if not millions, yet to be discovered. The discovery of a new type of spider isn’t that special, but most new finds are of itsy-bitsy little guys. Califorctenus cacachilensis—a hairy arachnid that measures four-inches wide with its legs extended—is quite unique. The details of this latest discovery have been published in the science journal Zootaxa. This eight-legged critter was actually discovered by researchers from the San Diego Natural History Museum back in 2013, but the results have only been published now (these things take time, especially when a new species is declared). Biologist Jim Berrian was on an expedition near the town of La Paz in Baja California Sur when he discovered the discarded exoskeleton of what appeared to be an unknown spider. With the help of colleague Michael Wall, the duo found an actual live specimen in a nearby cave, and then another in an abandoned mine shaft. After realizing this spider prefers dark and reclusive places, they managed to locate more, finding about two dozen specimens. They brought eight of these spiders back to their lab for analysis, eventually concluding that they’d stumbled upon a new species. 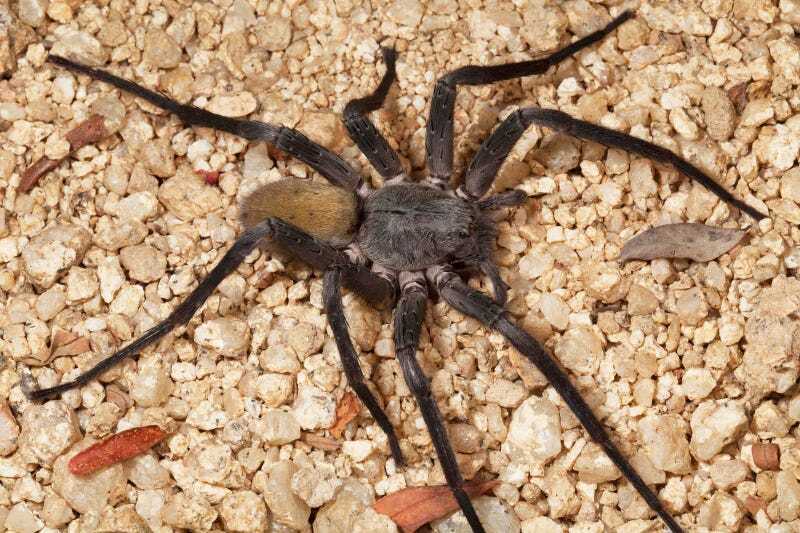 C. cacachilensis belongs to same group of spiders as the highly venomous Brazilian wandering spider, but the new species is not considered as dangerous. The new spider is hairy with a dark yellow torso and beady eyes. It’s unique to certain areas of the Baja Peninsula, making it an important find in terms of research and conservation efforts in the region. Oh, sure, casually shrug off a bite from this beast, why don’t ya. It’s not the bite that concerns us—it’s the emotional scars we’re worried about.